One of the biggest differences between a digital point-and-shoot camera and a dSLR (digital single-lens reflex) camera (such as the Nikon D5200) is the lens. With a dSLR, you can change lenses to suit different photographic needs, going from an extreme close-up lens to a super-long telephoto, for example. Lens compatibility: You can mount a wide range of lenses on your D5200, but some lenses aren’t fully compatible with all camera features. For example, to enjoy autofocusing, you need an AF-S or AF-I lens. Focal length and the crop factor: The focal length of a lens, stated in millimeters, determines the angle of view that the lens can capture and the spatial relationship of objects in the frame. Focal length also affects depth of field, or the distance over which focus appears acceptably sharp. Wide-angle: Lenses with short focal lengths — generally, anything under 35mm — are known as wide-angle lenses. A wide-angle lens has the visual effect of pushing the subject away from you and making it appear smaller. As a result, you can fit more of the scene into the frame without moving back. Telephoto: Lenses with focal lengths longer than about 70mm are telephoto lenses. These lenses create the illusion of bringing the subject closer to you, increase the subject’s size in the frame, and produce a short depth of field so that the subject is sharply focused but distant objects are blurry. Normal: A focal length in the neighborhood of 35mm to 70mm is considered “normal” — that is, somewhere between a wide-angle and telephoto. This figure offers an illustration of the difference that focal length makes, showing the same scene captured at 42mm (left image) and 112mm (right image). Note, however, that the focal lengths stated here are 35mm equivalent focal lengths. When you put a standard lens on most digital cameras, including your D5200, the available frame area is reduced, as if you took a picture on a camera that uses 35mm film negatives and then cropped it. This so-called crop factor varies depending on the camera, which is why the photo industry adopted the 35mm-equivalent measuring stick as a standard. With the D5200, the crop factor is roughly 1.5. So the 18–55mm kit lens, for example, captures the approximate area you would get from a 27–83mm lens on a 35mm film camera. (Multiply the crop factor by the lens focal length to get the actual angle of view.) In this figure, the red line indicates the image area that results from the 1.5 crop factor, as compared with the shot you’d get from a lens with the same focal length mounted on a 35mm film camera. When shopping for a lens, it’s important to remember this crop factor to make sure that you get the focal length designed for the type of pictures you want to take. Not sure which focal length to choose? Here’s a really cool online tool to help you understand the subject more: Nikkor Lenses Simulator. 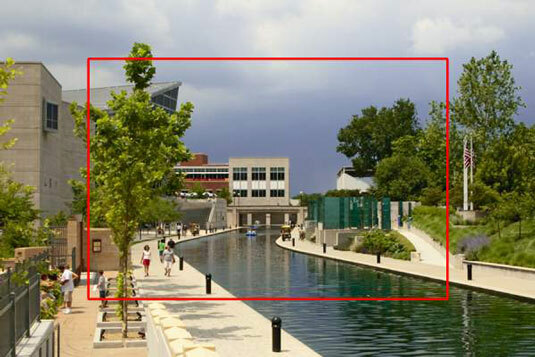 Using this interactive tool, you can see exactly how different lenses capture the same scene. Prime versus zoom lenses: A prime lens is one with only a single focal length. With a zoom lens, you get a range of focal lengths in one unit. Why select a lens that offers a single focal length when a zoom lens offers a range of focal lengths? In a word: quality. You typically see some reduction in picture quality at certain points in the range of a zoom lens. On the flip side, a zoom lens is certainly more convenient than carting around a bag of prime lenses with different focal lengths. And you can get exceptional image quality from many zoom lenses, even with some so-called super zooms, which offer a huge range of focal lengths. Aperture range: The aperture is an adjustable diaphragm in a lens. By adjusting the aperture size, you can control the amount of light that enters through the lens and strikes the image sensor, thereby controlling exposure. The aperture setting also affects depth of field: A wide-open aperture produces a short depth of field, so the subject is sharply focused but distant objects appear blurry; a narrow aperture produces a long depth of field so that both the subject and distant objects appear sharp. For the purposes of lens shopping, you need to know just a few things. Every lens has a specific range of aperture settings. Obviously, the larger the range, the more control you have over exposure and depth of field. The larger the maximum aperture, the “faster” the lens. Aperture settings are stated in f-stops, with a lower number meaning a larger aperture. For example, a setting of f/2 results in a more open aperture than f/4. And if you have one lens with a maximum aperture of f/2 and another with a maximum aperture of f/4, the f/2 lens is said to be faster because you can open the aperture wider, thereby allowing more light into the camera and permitting the image to be captured in less time. With some zoom lenses, the maximum and minimum aperture change as you zoom the lens. For example, when you zoom to a telephoto focal length, the maximum aperture generally gets smaller — that is, you can’t open the aperture as much as you can at a wide-angle setting. You can buy lenses that maintain the same maximum and minimum aperture throughout the whole zoom lens, but you pay more for this feature.